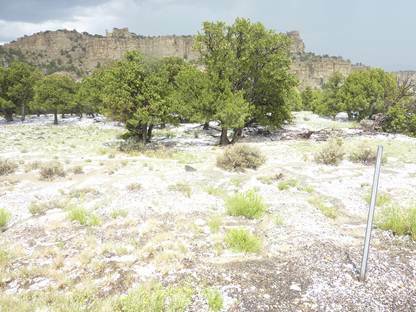 It’s hard to believe it’s been eight months since I got caught in the open by this high desert hail storm. The day before was filled with change, this day with challenges. The morning started out harmless enough. I walked to a family owned restaurant hoping for oatmeal and fruit, senior price of course. Even though it was past the opening time, it was closed. There was a handwritten note taped inside the glass door. “Sorry, we’re closed.” Down the street was J & B’s Hamburgers. What the heck, I’ll give it a try. They didn’t have oatmeal, nor did they have a senior price. Bacon, eggs, and pancakes it was. It tasted good with two giant pancakes on a second plate. I could only eat one. My plan to visit the Arches went awry as soon as I pulled out on US 191. Tired, I decided to skip the Arches. I don’t think eleven days in the saddle had anything to do with it. Within minutes, a D.E.E.R. appeared. With that omen, I should have been forewarned. US 191 took me through beautiful country, red rock formations, canyons, and some greenery. The remaining 90 miles were filled with vistas that artists dream about. My buddy Paul Wallace likes Moab for mountain biking. I can see why. The town is small, attractive, touristy, and bicycle positive. Unlike most towns on this trip, there were no “Bikers Welcome” signs. They didn’t get any of my money. Reaching Green River, Utah, I realized that this was where JAK had suggested we deviate from our plan last year, and take US 191 north to Jackson Hole. It was an outstanding decision with fantastic scenery. The lower half is different, all desert, but just as spectacular. I recommend either segment for a great ride. Next month, June 2013, JAK and I are riding to a Veterans Memorial Run in Marseilles, Illinois. We might take this route. Leaving Green River I took I-70 to Salina, Utah. It was hot and dry. That changed. Storms were brewing west and north. Rain chimneys were visible. Shortly after noon, a chimney materialized dead ahead. I kept going and got rained on for about a minute. With the temperature hovering around 100º, the rain cooled me off. Dry in minutes, I narrowly missed a second chimney. I was in for more than rain. I had nowhere to pull off when it started to rain. Ouch, this stuff hurts, it isn’t rain it’s hail. So much for finding a safe place to pull over, I stopped as fast as possible. The Ultra was not quite off the interstate. I didn’t care. I scrambled off and ran to some small trees for shelter. The hail stones came in two sizes, some the diameter of a dime, most that of a nickel. When I ran under the trees, the ground was dry except for falling hail stones. When I ran to the van, my sneakers were under swift moving water. The trees didn’t afford much protection. This picture was taken minutes after the hail stopped falling. In the short break between hail and the subsequent rain, I got into my foul weather gear. I had one question, Where are my boots? Two more cars and a motorcycle stopped to inquire if I was okay. None had been in the hail storm; it was pretty well confined to a small area, my head. Continuing on, it started raining heavily. I won’t say it was a cloud burst, but darn close. I could not find any shelter. I put on the 4-Way flashers and slowed to 30 MPH on the 70 MPH Interstate. Motorcycle helmets don’t have windshield wipers and my vision sucked. The cars passing me were all doing over sixty. To say I was stressed is putting it mildly. In Salina I went straight to the world famous Mom’s Café. The building was constructed in the 1890s. The café has been in continuous operation since 1926. When I finished eating, the rain had stopped, the temperature ninety plus. Once again off with the hot foul weather gear. It remained hot until I got into Nevada, the rain chimneys getting darker and closer by the minute. For two hours I fought winds strong enough to push the Ultra across the roadway, a tad scary. The area was desert with blowing sand. In one stretch the sand blew handlebar high across my path. It hurt like the dickens. I continued for a few miles after I took this picture. I pulled over and geared up. Five minutes later I was in the rain. 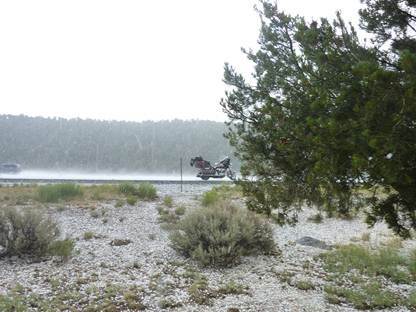 It rained the forty miles into Ely, Nevada. Of course, as I parked in front of the Motel 6 the rain stopped. I knew if I went downtown to eat, it would rain again, I ordered pizza. “It won’t be long.” After an hour I called. “The delivery man will be back soon and you’re up next.” How reassuring. Another hour passed before my cold pizza and warm soda arrived.